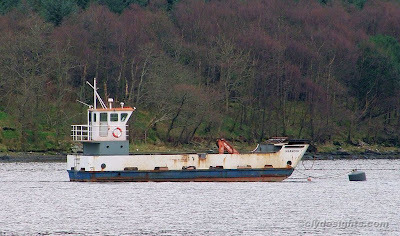 This little vessel, MARNOCK, equipped with a bow ramp similar to the smaller ferries plying around the Scottish coast, was seen at the northern end of Loch Striven. She is used to transport feed to some of the local fish farms and was built by the Ardmaleish Boatbuilding Co at their yard on Bute in 2000 for Sir Robert Smith, owner of the island of Inchmarnock, which lies off the southwest coast of Bute. Powered by two Cummins engines, she is 15 metres in length and has a tonnage of 30 gross tons. MARNOCK is fitted with a HIAB-type crane for handling loose cargo.